With November fast disappearing, I have finally been able to complete the writeup for the PDF version of the Rite that was undertaken this Samhain. It was a powerful one, that both me and my friend, Kagekabuki, put together for a local pagan group. ‘This ritual is written for performance on the night of Samhain, and is a variant on the traditional dead supper ritual carried out by many groups and covens. 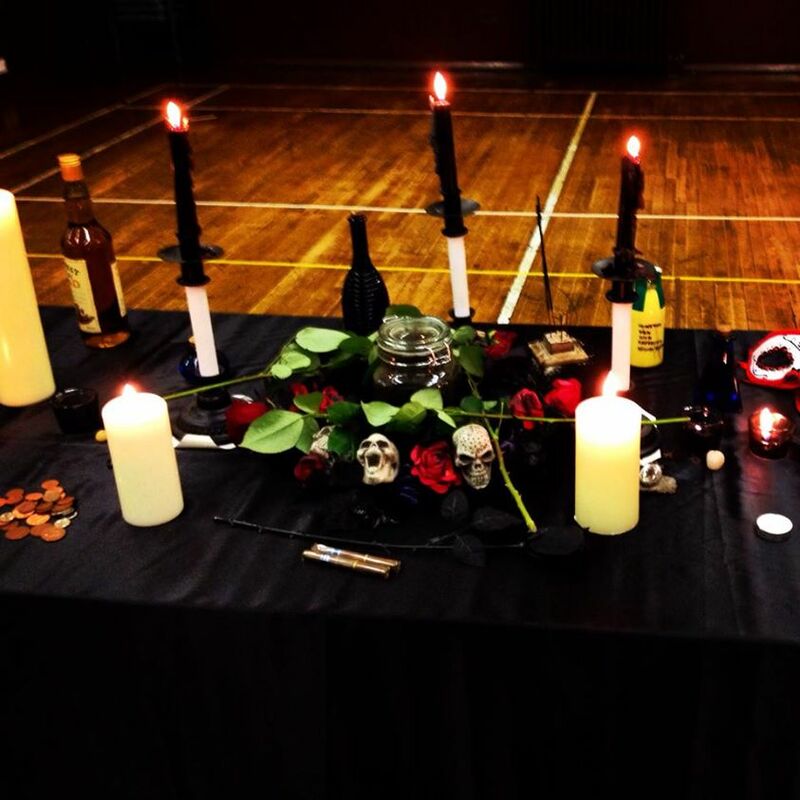 It was first performed on Samhain night in 2014, where it was successful in evoking the gods and the mighty dead, as well as directing the participants downwards to experience the celebrations being held within the underworld. The the main focus of this ritual falls heavily on the hallowed dead, of peoples spiritual lineage, and requires an active involvement by participants to connect to these spirits. The ritual requires two leaders, ideally one male and one female. The presiding Gods of the ritual that will be invoked are Hecate/Lucifer, and Woden/Hel, with the Path of Flames being the route the powers are accessed. Although the crossroads where The Path of Flames cross with Germanic Paganism may be obscured, it is a syncretic bond that arose out of the combination of two lines of practice, that was divined to be acceptable / encouraged by the Gods in question themselves. People who are interested in running this ritual are encouraged to carry out a divination of their own to detect/perceive this relationship to settle their minds if they find it a concern. As mentioned in the PDF, I’d like to thank the people who took part, as well as Kagekabuki for helping me get everything together and running the ritual alongside me. Please take a moment to visit her blog, which is unfortunately in that place we do not name.. Tumblr! In other news, I will be spending the next month or so on personal workings with the new doll i received, to empower it as to become my secondary familiar. I hope to detail this, as well as provide images before the empowering ritual has been performed. The spirit residing within it has already offered its sigil, so the process should be an intimate and rewarding one. The body for the primary familiar is finally on its way. Thank you for reading, I hope everyone had an enjoyable Samhain, and I look forward to the Winter solstice!